Site statistics is designed keep contractors up-to-date with the latest Site Registration data, including current registration figures, number of visits carried out by the Scheme’s Monitors and the average scores from those reports. The data is taken from the Scheme’s database and will be updated on a monthly basis. Click anywhere on the graph and drag your cursor to zoom in on an area of data. This graph shows the average score by month. This information is based on all site visits that took place during the time period shown in the graph. 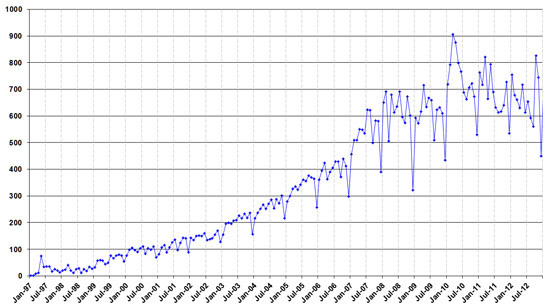 The table and graph below show the total number of Site Registrations by month within the selected time period. The table below shows the total number of visits by month within the selected time period. This table contains data that shows the contractors who have registered the highest number of sites with the Scheme. This table contains data that shows the clients who have registered the highest number of sites with the Scheme. The table below shows data from over the last 12 months. Superscript figure: Number of sites which have one or more operatives whose 1st language is not English. % Non English A: % of operatives on the sites represented by superscript figure whose 1st language is not English.. Complaints reported directly to sites over the last 12 months. No. of sites Total contract value Complaints total Complaints average No. of ops Ave dur. Note: Information on this report is collected by the CCS Monitor from the site manager when visiting the site. “Year to Acc” is a calculation of the statistical number of years that an operative would have to work on the type of site before they had a reportable or non reportable accident. It is calculated by multiplying the number of operatives by the duration for each site adding the resulting man-years of labour together and dividing by the number of accidents. It cannot be reversed calculated from the information on this report.